It is a term often used, dog whisperer. Giving the impression that communication with a canine is something of a rare achievement. A basic internet search will provide one with plentiful dog expert’s that offer advice and label themselves a dog whisperer. Let’s face it; you know your dog best. You spend every day with him; therefore you are best placed to work out why he behaves a certain way. Admittedly the humble dog is another species. Despite being genetically different to us human beings, parallels can be drawn with our behavior which may surprise you. Before you take the word of any dog whisperer, consider the similarities between us. We both need motivation to perform at our best level. People that are paid well and appreciated by their employers will be keen and interested to perform well. Children that are offered reward for good school results are inclined to study harder. Dogs that are offered a reward which makes them happy, whether in the form of food or a toy are motivated to learn. It has been proven repeatedly that dogs learn the best when they have prior knowledge of a desired reward. We both thrive in positivity. The human being will want to repeat a positive experience. It is within our natures to seek out activities that make us happy. We enjoy social contact with other human beings and enjoy contact with other species. We also feel proud when appreciated by the people that we love and respect which makes us want to repeat the behavior that earned such respect. 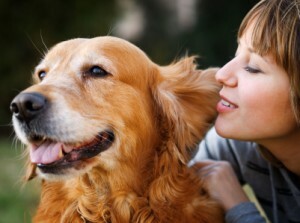 Your family dog loves positive interaction with you and the rest of his human family. He will find enjoyment when you are pleased with him and will want to please you further by repeating the behavior that prompted your pleasure. By nature your dog will also want to be around other dogs. The only exception to the happily social canine is the dog that has not been properly socialized. A dog that has not had contact with other dogs may show fear behaviors including aggression. If you have a dog like this and need help, research a local dog behaviorist. A good and well educated animal behaviorist will often avoid an egotistical term such as the dog whisperer. Our performance falters under stressful conditions. The human being can cope with a certain amount of stress and even thrive under it. If a manageable stress level is stretched further and we cannot cope then our performance will nosedive. Too much pressure, taking us beyond our personal capability will cause overload and leave us unable to perform, or learn anything at all. As people we often learn better when our confidence is high. Feeling confident can lead us to believe that we are able to take on the world and win. 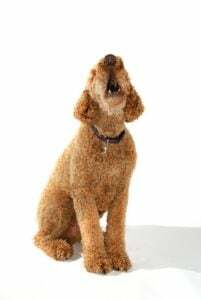 Inexperienced dog trainers can often place unmanageable demands on a dog. By asking too much of the canine during training sessions and not consolidating previous learning any trainer can cause their dog stress. A stressed dog will not learn. He will simply be unhappy and attempt to leave the situation. This unhappiness and sometimes fear, can be interpreted by a vexed and poorly educated trainer as unwillingness, or even worse dominant behavior. A self-titled dog whisperer that has received little formal education can easily use this theory to encourage others to misunderstand their own dogs in the name of dog training. In professional and properly educated dog training situations care is taken to keep the dog happy and the training undemanding. By asking too much of any dog, the trainer knows that he will simply over faze it. A good and effective dog trainer will know the dog’s personal limits. The excellent trainer will teach a dog something in careful stages keeping canine confidence high and setting the dog up for success throughout. Recall Training – How to Train Your Dog to Come! Recall training with your dog is crucial. 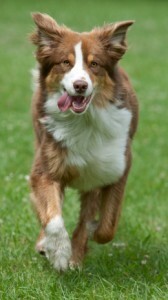 The majority of dogs need to be able to run free to use up their energies on a daily basis. If your dog will not come back when called, then exercise can become a worrying and frustrating time. The biggest thing to learn about recall with dogs is that you must be interesting and rewarding. If you are either irritated (by your dog’s lack of response) or offering your dog nothing worth coming back for, your attempts are unlikely to be successful. Think of it this way, if someone is trying to get your attention and they look angry you are probably going to avoid them. You will not meet an aggressive look if you can help it. This avoidance also applies with an angry owner and a disgraced dog. The dog will be even less likely to come when called if he has previously experienced punishment on his return. Look at your dog’s body language when he approaches you. If his head and tail are held low then he is uneasy returning. This reaction is often seen in dogs that have been rescued or suffered abuse in a previous home. To a dog lover this can be an upsetting behavior to encounter. If your dog is displaying this behavior then you can work to change it with plentiful reward, praise and positive physical contact. Get low to the ground and gently guide him into you with a food or toy reward. Make coming back to you a fun and pleasing exercise. A successful recall should be rewarded and reinforced. When learning how to train your dog to come back, you must keep this in mind throughout. 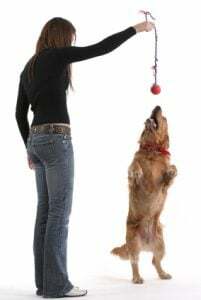 If your dog has bounced around you just out of reach for 20 minutes it can be difficult to reward, but you must. The frustrated dog owner that grabs a reluctantly returning dog and tells him off is simply teaching more reluctance to return. Recall can be taught in effective stages. Learning how to train your dog to come will be new for you too. The exercise is particularly enlightening if you have a new or difficult dog to train. Begin calling your dog back on leash and rewarding him. When you call your dog back guide him in to you with a treat. From the moment you ask him to come you must work hard to keep his attention only on you. So say his name, show him the treat and holding his reward at nose level guide him right back to you. When he has recalled successfully hold his attention until you release him with your voice. This will prevent him learning to grab his reward and leave again. You can refine this by taking his collar, giving him the treat then partnering the release command (off you go or similar) with release of his collar. When this process is smooth you can incorporate it into longer recall opportunities. These are best practiced first with no distractions then progressively including distractions such as dogs, people and other animals. Using a combination of techniques when working out how to train your dog to come will firstly get the best results and secondly help you decide what works for you and your particular dog. Have someone hold your dog and then you run away, short distances at first then longer, dependent on your dog’s capabilities call your dog and as they release guide in with the reward as before. Take the dog’s collar and give reward then release command. Recall races are great to improve motivation, two dogs held side by side and shown the treat in the same way will race keenly to you for the reward. Changing direction when out walking with your dog off leash will encourage him to watch you, as will taking the opportunity to hide if it arises. Call your dog back at random intervals during a walk. Reward and release will show the dog that he is not only called at the end of a walk, this will prevent him running away to prevent the walk ending. 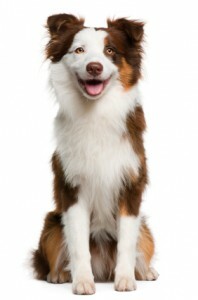 Different breeds of dog will need varying training techniques in order to get the best from them in all areas. All dog training should be positive and reward based. With research of your dogs breed traits you will easily work out how to train your dog to come back. Remember that consistency and kindness paired with motivation and reinforcement will get the best results. Dog training games provide so much more than mental stimulation to your dog. They enable handler control and encourage the dog to focus. They build the relationship between you and your dog and bring the same relationship onto another level. Imagine a dull lesson where you become confused and learn very little. No motivation is offered to encourage you to learn and the whole scenario leaves you feeling a little dull and dispirited. The person teaching you may look disappointed and frustrated throughout. You would certainly not look forward to the next lesson. In fact you could easily begin the dread these sessions and want to avoid them or withdraw into yourself. Now imagine the same lesson taught in an upbeat and interesting manner. Fun is involved in the learning process. You are given a reward when you get things right and motivated by the promise of this reward. During this session you are encouraged to learn in stages that you can understand easily. You will leave this type of lesson with a sense of achievement and look forward to the next one. 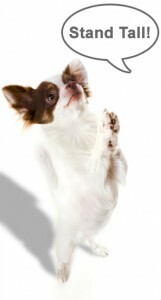 Using dog training games to teach your dog anything will work. In my humble opinion the word games should be used far more frequently at the end of the phrase “dog training”. Even the word gives a good feeling and certainly accentuates the level at which a dog should be taught. By making any learning experience a game for your dog you will be employing positive dog training. Old fashioned dog training has claimed that a dog must have respect and be shown dominance. This is neither modern nor proven dog training. Many problems that people encounter with pet dogs can be controlled simply by teaching the dog control and focus. We have all witnessed the frustrated dog walker repeatedly and almost desperately issuing a sit command to an over excited dog. A dog that is that is neither looking at nor paying attention to him. At some point we have probably all been that poor dog walker, I certainly have. There is no point in asking a dog to do anything if you do not have his attention. There is little point asking for his attention when highly distracted if you have not trained him to focus on you. By using dog training games you can bring your dog to a point where he looks directly to you for a reward when he sees a distraction. A brilliant game to encourage control and steady focus is based on reward. It is a simple game that can be carried out over a few minutes, a few times a day and will provide quick and effective results. You will need a reward that the dog likes and a quick hand. 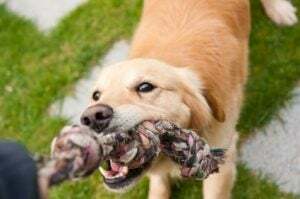 A food reward is probably best for this game, tiny pieces of something that the dog likes will be easy to work with and encourage the dog to want more. Smaller frequent treats are very motivating. Get your dog in a sit position (I assume that you have taught your dog to sit), and then drop a treat on the floor. What you will want to do at this point, is reward a good choice on your dog’s part. If your dog lunges or tries to get to the treat, then immediately put your foot over the treat. But on the other hand, if your dog is able to ignore the treat and looks at you, then give him another (and different) treat to reinforce this behavior. When the game is over, you can tell him to “Get It!” so that he can get the treat on the floor, or pick it up and give it to him. By proofing the command and lengthening the amount of time before rewarding, you are establishing focus and control and at the same time playing fun dog training games that allows your dog to think and gives your dog the opportunity to make a choice. Try this with many different distractions, including toys, other people and even other dogs. As long as you have your dog on a leash and that he can’t leave you for the distraction, you should be able to reward the right choice. When your dog knows to look to you before reacting to something, in this case his treat, he will eventually learn to do the same with other distractions. By employing this focus technique to all your dog training games you will obtain the best results. Basic dog training is not complicated. To train a dog is simply to teach him to do something. Dog training is often seen uniquely as teaching a dog to behave nicely, or do specific tricks to impress. What many people do not understand however is that is just as easy, if not easier, to train a dog to misbehave. Simply put, much of the dog training that happens within the average home is not of the formal variety. If we react to our dogs behavior in a way that he finds rewarding, then we are training him to repeat that behavior. To a dog there are no good and bad behaviors, simply rewarding and non-rewarding behaviors. If we keep this in mind we can never accuse our dog of naughtiness for he is only carrying out an action that benefits him, often with reinforcement from us as his handler. When interacting with your dog in any way begin to assess whether he sees the interaction as a reward. You will then be able to work out whether you are unwittingly reinforcing his behavior therefore encouraging it to continue. 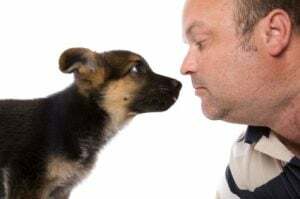 A great rule to adhere to throughout your life with a dog, is simply ignoring the unhelpful behavior and reward the behavior that you would like him to repeat. This rule is probably the most important thing to learn when you are carrying out basic dog training with a pet dog. Professional dog trainers that use reward and reinforce techniques apply this rule to everything they do. 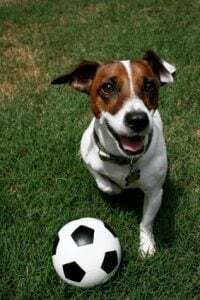 Add motivation to the rule and you can teach your dog everything from perfect pet dog behavior to competition obedience and everything in between. The best basic dog training is positive and reward based. There is no room for any type of punishment within positive dog training. Punishment does not work and will produce a confused and unhappy dog. Basic commands can be easily taught in a positive manner. By reinforcement of a particular behavior, or specifics that may lead to the behavior, you are allowing the dog to work things out for himself. Sit – Show the dog a reward then wait for him to sit. That’s it! Do not ask him to sit or lure him, do not touch him in any way and if he tries to jump up to get the treat hold it up higher. Take the treat further away if he tries to help himself to it. Your dog will eventually sit. It is inevitable and when he does sit then reward him with the treat immediately. Timing must be perfect for him to make the connection between action and reward. When you reward him add the word sit. Repeat this and soon your dog will be sitting much sooner. He will work out what prompted the reward previously and offer the same behavior, easy. Down – The down command can be taught in the same way. It may take longer as lying down will take more thought than sitting. An easy cheat to provoke your dog to lie down is to pop the treat under your foot. He will then lie down in order to try and get to the treat, when he is on the ground reward by lifting the foot and add the command word. You can even tap your foot whilst it covers the treat. This will associate the tap with the lie down for a treat in your dog’s mind. You can then use the foot tap without a treat and reward the lying down directly from your hand. Leash walking – Positive reinforcement can be used to encourage a slack leash when out walking. Simply by using reward when the leash slackens. There are various ways to encourage a slack leash. 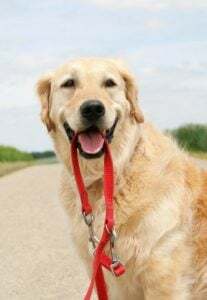 Changing direction, stopping walking and calling the dog back will all slacken the leash and then correct timing and reward can reinforce the behavior. Basic dog training should always be a positive experience for both dog and owner.